The What: StrandVision Digital Signage has a new line of large-format, free-standing pedestal Light-Emitting Diode (LED) digital media player displays. StrandVision also has standardized pricing for several new sizes of LG commercial-grade LED digital displays, as well as smaller pedestal and wall-mountable displays. Sourced from United Visual Products, Inc. of Milwaukee, the new display items are available directly from StrandVision and through authorized StrandVision resellers and system integrators. Floor Pedestal (kiosk) Screen LED displays in 1080p 46 and 55 vertical configurations with speakers and a two-year warranty. The units are pre-configured with the StrandVision Digital Signage R360 Linux Digital Media Player. Smaller, 22, tabletop pedestal and wall-mountable wood-framed (cherry, oak and walnut) display options are also available. 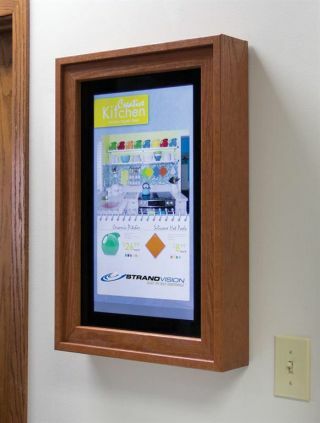 One More Thing: Available with the pre-configured StrandVision Digital Signage R360 Linux Digital Media Player, which mounts behind the unit to facilitate electronic signage installation/startup and administration.